The Ishida Uni-3 Scale Label Printer is the latest scale from Ishida and offers a powerful feature set at a very affordable price. The Ishida Uni-3 Scale Label Printer is perfect for wholesale stores, butcher shops, deli counters, grocery stores, fish departments, health food stores, and supermarkets of all sizes. Whatever your store size or needs, the The Ishida Uni-3 Scale Label Printer can handle any department. 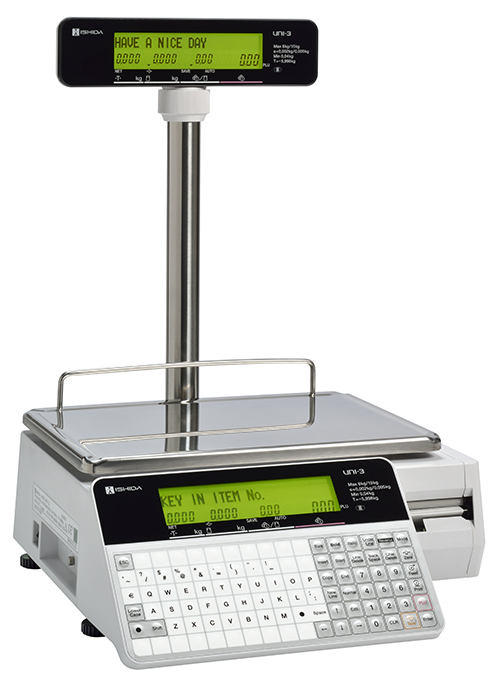 The Ishida Uni-3 Scale is offered in several model configurations: Bench Scale, Pole Scale, Elevator Scale, and Hanging Scale. The Elevator and Hanging Scale options are both by special order only. 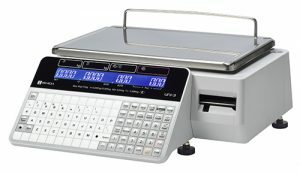 The Ishida Uni-3 Scale Label Printer is offered with two display types, the L1 and the L2. The Ishida Uni-3 L1 Scale display type has a one-line blue back light display (LED) with a sharp white 16-segment display capable of showing momentarily the PLU name and then swapping to numeric data such as price and PLU number. The Ishida UNI-3 L2 models come with a two-line green/orange back light liquid crystal display (LCD), one line features alphanumeric information such as commodity description and the second line shows numeric information such as price and PLU number. The optional ScaleLink Pro 5 (SLP5) software is a powerful PLU management software designed for Windows. The SLP5 software suite makes it possible to manage one or many Ishida scales or similar or different models from a back office PC workstation. Program PLUs, change prices, change label formats, advertising messages, logo images and a variety of other important scale functions. Reduce your shrink by 30% and your labour by 50% by integrating your scales with Catapult Retail POS directly with the optional E-Plum Enterprise Scale Management Software from Invatron. With E-Plum connected to your Ishida Uni-3 Scale Label Printers, your scales will automatically receive new PLUs and item changes simply by editing them in your Catapult POS Software – maintenance that you have to do anyway. E-Plum integration eliminates time consuming double entry (once in the POS, and then duplicating the effort again at the scales). E-Plum integration also improves item accuracy by reducing item programming errors causing mismatch between the POS and the Scales.